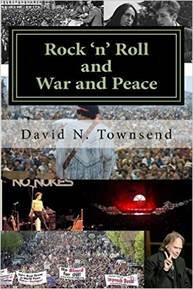 I’m proud to announce the publication of my new book, Rock ‘n’ Roll and War and Peace. The book chronicles and examines the relationship between popular music in the Rock era and the politics and ideology of war and peace throughout the past half-century. This is a topic that, while it’s been touched on in a variety of ways, has never been deeply explored in a single coherent work, especially one that links the various eras and movements, from the 1960s through the 2000s. The book offers portraits of dozens of artists and insights into the meaning and impact of hundreds of songs across more than five decades, from the Vietnam conflict through the climax of the Cold War to the Iraq War. If you’re interested, you can purchase a hard copy or Kindle download at Amazon here. This book began as a chapter in my ongoing larger project on the history of Rock Music: “Changing the World: Rock ‘n’ Roll History, Culture, and Ideology”. The topic of the links between music and War and Peace became so compelling that I expanded them into a full treatise and complete book. The full project continues, and the other earlier chapters are still available here on this site for anyone to read and download (just please give me credit if you cite them). Please don’t hesitate to contact me with any comments or questions about any of my Rock Music writings. I plan to add a public blog to this site sometimes soon, as well. You can also join me on my Facebook Page for Rock ‘n’ Roll and War and Peace, where I offer regular thoughts, updates, and discussions on the topics and artists of the book. Does anybody remember Rock 'n' Roll? Rock music? You know, "be-bop-a-lula," and "my baby love," and "psycho killer, qu'est-ce que c'est"? Remember when it was rebellious to crank your bedroom stereo (or phonograph) to maximum on a Hendrix or Black Sabbath tune? How about standing around at a High School dance, making fun of the band as it tried to play a Stones or U2 song, while quietly dreading the moment when the inevitable slow dance number would begin? Was it "Loving You" by Elvis this time? Or was that another era, somebody else's life? It seems a long time ago, doesn't it? Except sometimes, when you're driving in rush hour, and you click on the Oldies, or Classic Rock, or Hits from the 80s station, and they just happen to hit the nail right on the head ("Sgt. Pepper"? "Kashmir"? "London Calling"? ), you're transported back, for a few minutes, to those powerful, magical times, when the music was so much a part of the fabric of life. When you used to put on an album or a 45 and just listen to it, doing nothing else but maybe staring at the jacket, or singing and air guitaring along. When the songs had meaning, because they were happening now, and your experience seemed in parallel with their images. I remember a lot, and I've tried not to let go of that connection to Rock music. I've also thought a lot about it (and talked, and listened, and danced, and played, and taught). Consequently, I've written a lot, too, because that's what I do. These pages, then, are dedicated to expression of the ideas and feelings, and simple joy, that Rock 'n' Roll has inspired in so many of us. Miscellaneous musings on various groups, albums, movements, concerts, and other issues. Whatever comes to mind, usually while listening to tunes. The Eagles, live in Bangkok, February 20, 2011. My review. That's right, this is where self-indulgence truly reaches a pinnacle. Some day, when I have the time and technology, I'll post some actual .wav files here of stuff I've recorded. For now, it's mostly lyrics and some chords, possibly some sheet music files if I get ambitious. It's all just for the heck of it, but hey, if you see something you like, let me know.